© Richard Biffle and Terrapin Beer Co.
Slugging back a couple cold beers on a hot day is as much a part of baseball as peanuts, Cracker Jacks and screaming insults to the opposing team’s left fielder from the bleachers. Now, the Atlanta Braves, with a little help from the local Terrapin Beer Company, has found a way to intertwine beer and baseball even more intimately: For the 2017 season, the Braves’ SunTrust Park will be serving up Chopsecutioner, a beer aged on baseball bats. 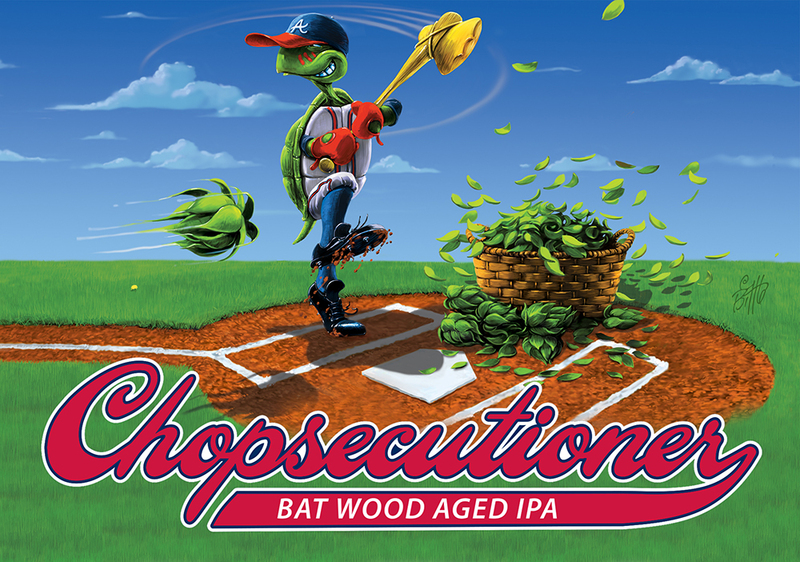 Chopsecutioner Bat Wood Aged IPA—named after the Braves’ signature tomahawk chop and the brewery’s own Hopsecutioner IPA—is built for baseball in other ways. Unlike the 7.3 percent ABV Hopsecutioner, its sportier Chopsecutioner sibling is only 5 percent ABV. “When I’m sitting in the hot sun watching a baseball game, 7.3 percent alcohol beer is pretty tough, especially if you have a couple,” Buckowski opined. This baseball-themed brew is a bit closer to “sessionable” range. Additionally, this brew has its literal roots in the ballpark: The beer was created at Terrapin’s new 5-barrel pilot brewery located inside SunTrust Park. And if you want to try this beer, the ballpark is where you’re going to have to head: Chopsecutioner will be available all year long exclusively on draft at the home of the Braves. As Beer Street Journal points out, this isn’t the first time a beer has been aged on baseball bats: Homefront IPA—a beer created to raise money and awareness for Operation Homefront and brewed by multiple breweries across the country—is aged on specially engraved Louisville Sluggers, and has been for years. However, Chopsecutioner appears to the first bat-aged beer to be tied to an MLB team. Will it lead the Braves to a World Series title? Not to be a downer, but let’s just say that the beer might be a bigger draw than actually watching Braves play. Six games into the season and they already have the worst record in the National League.